The glamour of the Rosecliff Mansion provides an exquisite backdrop for Rosecliff Mansion Wedding Photos. The old-time elegance of the mansion’s architecture transports wedding guests to a time of wonder and class. The interior of the mansion is just as ornate and splendid, giving a photographer ample opportunities for divine Rosecliff Mansion Wedding Photos. In the midst of such a beautiful setting though, it is important to remember that the stars of the day are the bride and groom. 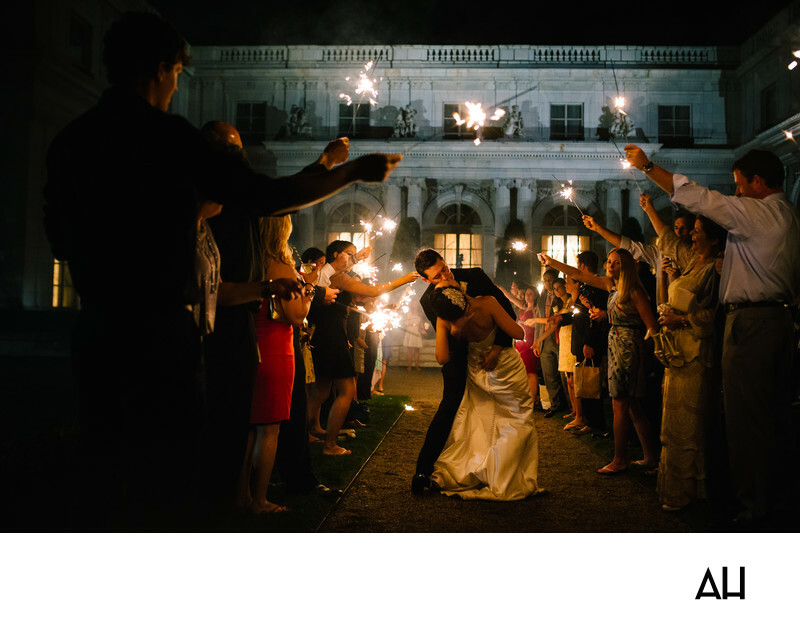 This picture focuses attention on the couple as they are surrounded by their loved ones in the courtyard of the Rosecliff. The guests each hold a sparkler to send the newlyweds off at the end of the reception, with the mansion set in the background. The mansion stands regal in the backdrop and adds to the timeless allure of the photo, without taking away from the moment between the bride and groom. Having a “send-off” at the end of the evening gives the guests a chance to see the bride and groom one last time before the day is done. In this picture the groom dips his new wife and kisses her, while their family and friends wish them well and light their way forward.